Full length protein corresponding to Podoplanin/ gp36. MDCK cells stably expressing Podoplanin/ gp36 protein. In Western blot, this antibody gave a positive signal in human placenta and skeletal muscle tissue lysates. Our Abpromise guarantee covers the use of ab10288 in the following tested applications. 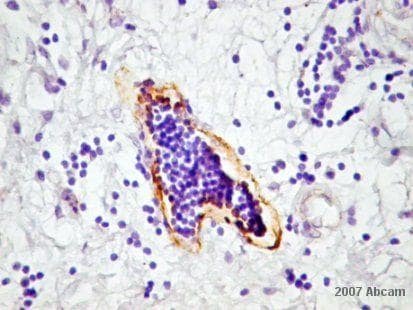 IHC-P Use a concentration of 6 - 30 µg/ml. Perform heat mediated antigen retrieval before commencing with IHC staining protocol. WB Use a concentration of 5 µg/ml. Detects a band of approximately 35 kDa (predicted molecular weight: 24 kDa). May be involved in cell migration and/or actin cytoskeleton organization. When expressed in keratinocytes, induces changes in cell morphology with transfected cells showing an elongated shape, numerous membrane protrusions, major reorganization of the actin cytoskeleton, increased motility and decreased cell adhesion. Required for normal lung cell proliferation and alveolus formation at birth. Induces platelet aggregation. Does not have any effect on folic acid or amino acid transport. Does not function as a water channel or as a regulator of aquaporin-type water channels. Highly expressed in placenta, lung, skeletal muscle and brain. Weakly expressed in brain, kidney and liver. In placenta, expressed on the apical plasma membrane of endothelium. In lung, expressed in alveolar epithelium. Up-regulated in colorectal tumors and expressed in 25% of early oral squamous cell carcinomas. Belongs to the podoplanin family. Extensively O-glycosylated. Contains sialic acid residues. O-glycosylation is necessary for platelet aggregation activity. Membrane. Cell projection > filopodium membrane. Cell projection > lamellipodium membrane. Cell projection > microvillus membrane. Cell projection > ruffle membrane. Localized to actin-rich microvilli and plasma membrane projections such as filopodia, lamellipodia and ruffles. ab10288 at 1/500 dilution staining human thymus specimen tissue sections by IHC-P. The tissue was formaldehyde fixed and a heat induced epitope retrieval step was carried out. The tisse was then blocked and incubated with the antibody. An HRP conjugated rabbit antibody was used as the secondary. 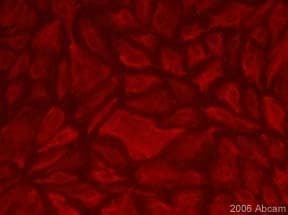 ab10288 at a 1/500 dilution staining human dermal lymphatic endothelial by Immunocytochemistry. The cells were grown in coverslips and fixed in formalin prior to permeabilization with tritonX-100. The cells were incubated with the primary antibody at 1/500 for 1 hour and then bound antibody was detected using a biotinylated goat anti-mouse antibody. Texas red-streptavidin was used for development. This image is courtesy of an Abreview submitted by Maria Navarro. Podoplanin protein is extensively glycosylated. This might explain the observation of a band at a higher molecular weight than predicted. Overlay histogram showing HCT116 cells stained with ab10288 (red line). The cells were fixed with methanol (5 min) and incubated in 1x PBS / 10% normal goat serum / 0.3M glycine to block non-specific protein-protein interactions. The cells were then incubated with the antibody (ab10288, 1µg/1x106 cells) for 30 min at 22°C. The secondary antibody used was DyLight® 488 goat anti-mouse IgG (H+L) (ab96879) at 1/500 dilution for 30 min at 22°C. Isotype control antibody (black line) was mouse IgG1 [ICIGG1] (ab91353, 2µg/1x106 cells) used under the same conditions. Acquisition of >5,000 events was performed. This antibody gave a slightly decreased signal in HCT116 cells fixed with 4% paraformaldehyde (10 min) used under the same conditions. Please note that Abcam does not have data for use of this antibody on non-fixed cells. We welcome any customer feedback. Western blot analysis of Podoplanin expression in human lymphatic endothelial cells (LEC) - lane 1, and HUVECs - lane 2. Total lysate of both cell types were subjected to SDS-PAGE and subsequent western blot analysis with ab10288. The antibody recognizes a protein of about 36 kDa in total lysate from LECs but not from HUVEC. Immunocytochemistry/Immunofluorescence analysis of human dermal lymphatic endothelial cells (HDLEC) labelling Podoplanin / gp36 with ab10288. An Alexa Fluor® 488-conjugated goat anti-mouse was used as the secondary antibody. Nuclei counterstained with DAPI. Publishing research using ab10288? Please let us know so that we can cite the reference in this datasheet. Does ab10288 work in mouse? What secondary antibody can we use? If we use ab11936, what secondary should we use? As discussed on the telephone, far as we are aware, ab10288 Podoplanin / gp36 antibody [18H5] has never been tested with samples from mouse. All tested species cross-reactivity information is stated on our datasheets, and these are updated as soon as any new information is brought to our attention. I have reviewed the alignment of the immunogen for this antibody with the mouse protein, and regrettably this is low at 39%. Therefore, we would not expect this antibody to detect in mouse samples. I'm sorry this is not better news for you. I can recommend that ab11936 Anti-Podoplanin / gp36 antibodywould be amore suitable option as it is already tested in mouse. You will need to ensure it is tested in the application you are using so it is covered by the guarantee for your experiments. If your chosen application is not listed as tested on the datasheet, please do not hesitate to let me know before you purchase, as you may be eligible for our testing discount program. https://www.abcam.com/index.html?datasheet=11936 (or use the following: https://www.abcam.com/index.html?datasheet=11936). I have bought your product, ab10288. There is a technical problem. Which Antigen retrieval method is recommended for this product? I can’t find it in the datasheet. Thank you for your help. Thank you for your enquiry. The recommended method for this antibody is heat-mediated antigen retrieval with citrate buffer, pH 6.0. I have updated the datasheet with this information. I hope this helps. Please do not hesitate to contact us if you need anything further. Looking at the rechnical data sheet for the product, I see the text: Description: mouse monoclonal to gp36/podoplanin but then there is this Relevance: Produced from sera of rabbits immunised with the recombinant ectodomain of Podoplanin(gp36). Regardless, I did order the product thinking that it is the mouse monoclonal. I hope that's true. Please remove the confusing statement. Thank you for your enquiry. I can confirm for you that this antibody, ab10288, is indeed a mouse monoclonal antibody (clone number 18H5). The statement in the relevance section, "Produced from sera of rabbits immunised with the recombinant ectodomain of Podoplanin(gp36)" is a mistake and I have removed it. The statement refers to the rabbit polyclonal gp36/podoplanin antibody, ab10274. I apologize for the confusion. If you have any additional questions please contact us again. A customer of ours would like to know if ab10288 (gp36 antibody clone 18H5) works on paraffin-embedded sections. The datasheet only lists "IHC;" it does not distinguish between frozen, paraffin-embedded, etc. Thank you for your patience. We would like to confirm that this antibody has been tested on paraffin embedded section.